The livestock productivity in Ethiopia is seriously constrained by the shortage of fodder due to increasing soil salinization. Therefore, restoration of salt-affected lands into productive soils through salt-tolerant forages and improved irrigation and crop management practices is crucial for enhancing the productivity of the livestock sector in Ethiopia. 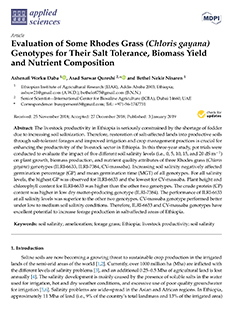 In this three-year study, pot trials were conducted to evaluate the impact of five different soil salinity levels (i.e., 0, 5, 10, 15, and 20 dS m-1) on plant growth, biomass production, and nutrient quality attributes of three Rhodes grass (Chloris gayana) genotypes (ILRI-6633, ILRI-7384, CV-massaba). Increasing soil salinity negatively affected germination percentage (GP) and mean germination time (MGT) of all genotypes. For all salinity levels, the highest GP was observed for ILRI-6633 and the lowest for CV-massaba. Plant height and chlorophyll content for ILRI-6633 was higher than the other two genotypes. The crude protein (CP) content was higher in low dry matter-producing genotype (ILRI-7384). The performance of ILRI-6633 at all salinity levels was superior to the other two genotypes. CV-massaba genotype performed better under low to medium soil salinity conditions. Therefore, ILRI-6633 and CV-massaba genotypes have excellent potential to increase forage production in salt-affected areas of Ethiopia.